Avalanche Risk Reduction » Try out the Munter Reduction Method! There are touring backpacks for most kinds of tours. This includes mountain tours as well as hiking and biking. However, the conditions in snow and ice as well as the high cost of materials while skiing make different demands on a special ski touring backpack. But ski touring backpacks differ from conventional touring backpacks not only in that they carry skis and need to be able to be used with gloves. 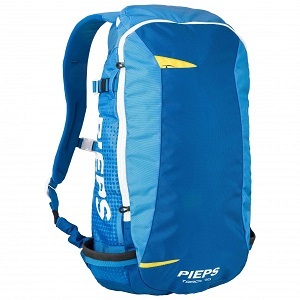 There's more information about ski touring backpacks here. In general, such backpacks for using in the cold are between 25 and 40 liters in volume. The small model is enough to bring warm clothes, a first aid kit, food and a thermos for an extended day trip. A large ski touring backpack has enough space and load capacity for a multi-day tour or carrying a lot of hardware (shovel and avalanche transceiver). Ski touring backpacks have a body-hugging fit. With a padded back system and stabile hip belt, they are secure with any movement. This kind of backpack also has a narrow cut, to aid packing with gloves, but they're not completely flat. Most have a lateral opening (RV) so you can load and unload the backpack like a suitcase. Sometimes there's even a U-shaped zipper on the back. So the entire back system can be opened easily and leads easily to the backpack inside. The materials of ski touring backpacks are strong and resistant to abrasion. There are also a number of additional mounting options for poles, helmets, skis and snowboard or snowshoes. Carabiners and other small items can be stowed neatly on gear loops and daisy chains. A snow gaiter ensures you can keep your backpack with lid compartment clean. There are also special compartments for emergency equipment in most ski touring backpacks. There's space for avalanche probes, beacons, shovels and first aid kits (also:avalanche backpack). A whistle on the chest harness ensures safety and is a standard feature of a good ski touring backpack. As most ski touring backpacks are compatible with hydration systems, you should also consider additional insulation for the hydration tube (possibly also the hydration system) due to the cold temperatures! Conveniently, many ski touring backpacks have an insulated duct made of neoprene for the hydration tube on the shoulder strap.